Having seen the violence that accompanied some of the second immigrant caravans trying to reach the US border, President Donald Trump yesterday warned that the military would be allowed to shoot if they were assaulted like the Mexican police were on videos seen this week. 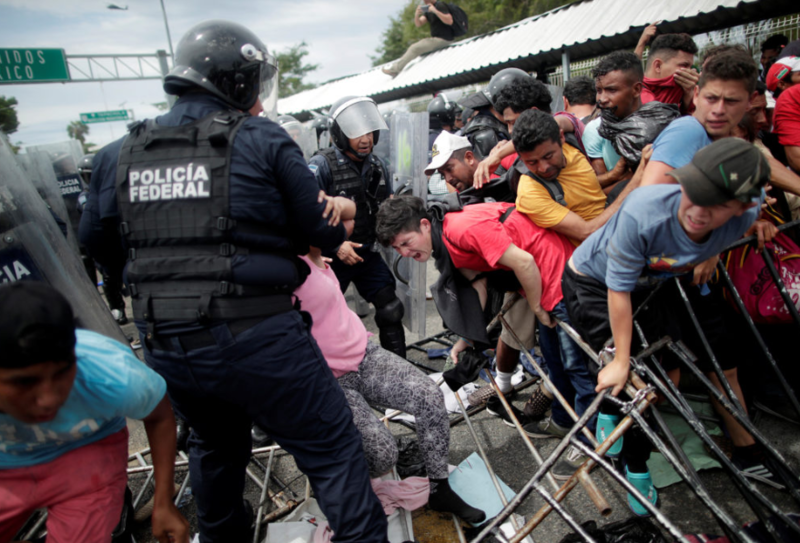 As covered earlier (see link), a group of immigrants that tried violently to cross from Guatemala to Mexico hurled stones at the police as they were blocking from entering at the border. One person died in the commotion. Related coverage: <a href="http://thegoldwater.com/news/40727-New-Caravan-Confrontation-With-Mexico-Police-Leaves-1-Dead-Video"> New Caravan Confrontation With Mexico Police Leaves 1 Dead (Video)</a>. Mexico’s latest estimates were that the first caravan, which left Honduras in mid-October, is now at 2,800 to 3,000 people. Other caravans, also made up of people who have left poverty and violence at home, have since followed. Their estimates are unclear. US President Donald Trump said he now plans to sign an executive order next week to stifle the requirements that asylum seekers will face when entering the United States to come into the country through a legal port of entry. Speaking to reporters, he stated: "Migrants seeking asylum will have to present themselves lawfully at a port of entry." "Those who choose to break our laws and enter illegally will no longer be able to use meritless claims to gain automatic admission into our country." President Trump ordered over 5,000 troops to secure the border from the approaching caravans, and stated that they will be ready to react if violence is used against them: "They want to throw rocks at our military, our military fights back. We're going to consider, and I told them to consider it a rifle. When they throw rocks like they did at the Mexico military police, I say: Consider it a rifle." Advocacy group Human Rights First reacted with a statement: "President Trump's attempt to paint peaceful families seeking asylum as a national security threat is as absurd as it is cruel." "The president is fear mongering to score political points ahead of a contentious election at the expense of people's lives." About time the West shows some backbone in the face of foreigners.